Scientists at Queen Mary University of London have found a way to place catalysts inside the tiniest pores of different host materials, a bit like when model ships are unfolded inside a bottle. In the case of catalysts, which are materials that speed up chemical reactions, confinement may lead to higher activity. It keeps particles well separated, which is key to prevent loss of function in catalysis, and preserves their highly reactive surface. Similarly, when a material is squeezed in a small space, its electrons are not free to move as far as usual and the material's light emission colour could change - an effect that could be used in micro lasers. This strategy also opens up the possibility of multifunctional materials in which either the guest and host do different things separately or, because the guest is confined, the interactions between the host and guest may produce novel properties. To illustrate the approach, the researchers used porous nanomaterials which are like sponges but with 1 nm pockets inside where other molecules can fit. However, loading reactive catalysts inside a nanoporous host is challenging because often the reaction conditions can destroy the host. The study, published in Nature Communications, demonstrates a concept which uses thermodynamics to overcome these issues. The researchers realised that they can estimate the stability of the host under various reaction conditions. The research was carried out with University of Cambridge, Dalian Institute of Chemical Physics (Chinese Academy of Sciences), National University of Singapore and The University of New South Wales. Principal investigator Dr Stoyan Smoukov, from Queen Mary University of London, said: "We had some ideas that confinement could change properties, as such changes have been seen in other systems. The question was - was there a general way in which we could try and guide researchers so they could synthesise all kinds of large guests with various functions - like metals, metal oxides, sulfides, nitrides - without destroying the hosts?" 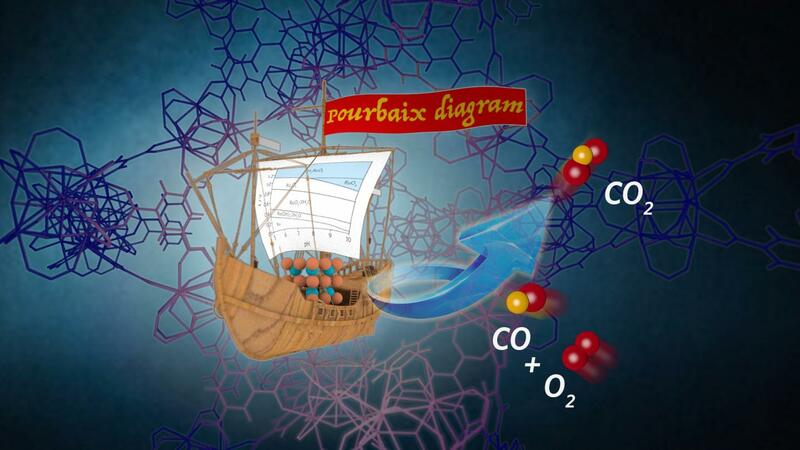 Using thermodynamic diagrams the researchers developed a concept called Pourbaix-Enabled Guest Synthesis (PEGS), where conditions and precursor compounds can be chosen not to destroy the hosts. They include a tutorial system that demonstrates how to make a large variety of new guest/host combination compounds. Co-corresponding author, Professor Qiang Fu, from Dalian Institute of Chemical Physics (Chinese Academy of Sciences), added: "From a practical perspective, the PEGS approach links the materials chemistry with the design of functional materials for applications such as heterogeneous catalysis. The confined oxide nanostructures obtained by the PEGS method in this work can present enhanced catalytic performance, which is of great significance for design of advanced oxide catalysts."